The 2016 UND Volleyball squad poses for a team photo shortly after securing its first-ever berth in the 64-team NCAA Division I national tournament. 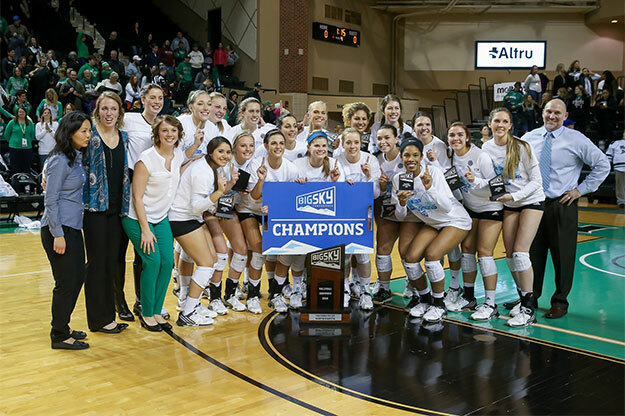 The Fight Hawks defeated the Northern Arizona University Lumberjacks in straight sets Saturday night at the Betty Engelstad Sioux Center in its quest to become the Big Sky Conference and Tournament champion. Photo by Shawna Schill. 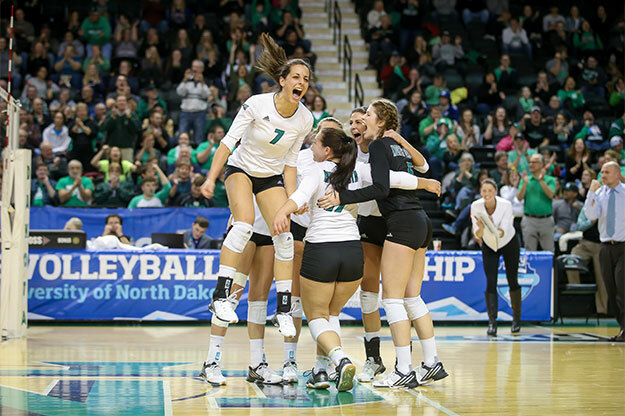 It was another big weekend for two UND Fighting Hawks athletic programs. The volleyball squad punched its ticket to the NCAA Division I Tournament for the first time in school history on Saturday after a tough yet convincing win over the Northern Arizona University (NAU) Lumberjacks in the Big Sky Conference Tournament Championship match at the Betty Engelstad Sioux Center. Then early Sunday morning, the UND football team learned that it, too, will be part of an NCAA Division I postseason tourney — another first for UND and its football program. Seeding and first- and second-round pairings were announced for the NCAA Football Championship Series (FCS) playoffs at 10 a.m. on ESPNU. 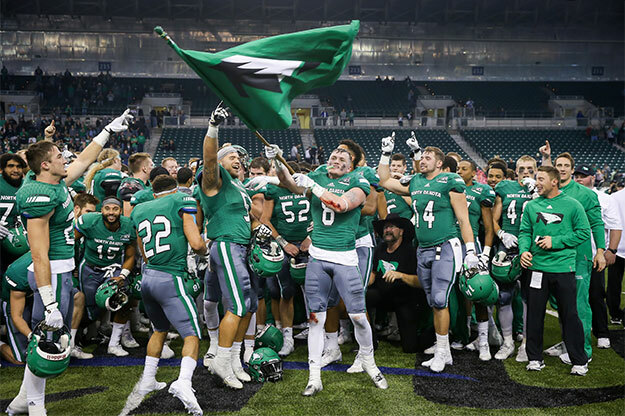 UND football players celebrate after winning a share of the Big Sky Conference championship after knocking off the Northern Arizona Lumberjacks on Nov. 12 at the Alerus Center. The Fighting Hawks footballers have since found out that they, too, will compete for the first time in the NCAA Division I Football Championship Series playoffs at 5 p.m., Saturday, Dec. 3, in the Alerus Center. Their opponent has yet to be determined. Photo by Shawna Schill. The football players gathered with their coaches and UND President Mark Kennedy at Buffalo Wild Wings in Grand Forks to hear the news. They were hoping to get at least a Top 8 seed in the playoffs, securing for them a first-round bye and a chance to rest and heal for another week. The team let out a boisterous roar of excitement when the NCAA announced that UND would be a No. 7 seed in the 24-team field. The moment was captured and shown nationally on ESPNU. The feeling was extra special after last year’s team thought it had built a résumé good enough to get into the playoffs with a 7-4 record but was ultimately snubbed from selection. This season’s mantra has been to “leave no doubt,” and the team did just that, amassing an even more impressive 9-2 record and steamrolling through the Big Sky Conference portion of its schedule undefeated. On Saturday night, it was the volleyball team on center stage at the Betty. The Fighting Hawks, who were 3-0 straight-set winners over NAU, stormed the court and mobbed each other in jubilation after one last NAU kill attempt sailed just out of bounds. It marked the achievement of a goal set last summer before the team gathered for its first practice. UND Fighting Hawks Outside Hitter Tamara Merseli reacts to a point scored against the Northern Arizona University (NAU) Lumberjacks Saturday night at the Betty Engelstad Sioux Center. Merseli and her teammates defeated NAU and will now represent the Big Sky Conference in the NCAA national tournament. They will learn who they play on Sunday, Nov. 27, when the NCAA Women’s Volleyball selection show announces tournament pairings on ESPNU. Photo by Shawna Schill. UND will find out its opponent in the 64-team NCAA Tournament during the NCAA Selection Show on Sunday, Nov. 27, at 9 p.m. on ESPNU. 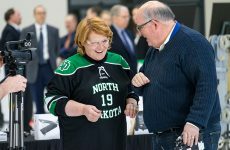 UND President Mark Kennedy was among the more-than-1,500 fans in attendance Saturday. Kennedy helped UND Athletic Director Brian Faison present the Big Sky Tournament Championship Trophy to the Fighting Hawks women. The Fighting Hawks showed their dominance in the post-tournament awards ceremony as well. UND placed four players, including Tournament Most Valuable Player Faith Dooley, on the All-Tournament Team. The others were team setter Sydney Griffin and outside hitters Chelsea Moser and Tamara Merseli. UND’s record now stands at 26-9, including a stellar 14-2 conference mark. UND’s second-round playoff game will kick off at 5 p.m. at the Alerus Center. Tickets go on sale this Monday morning at 10 a.m. at the Ralph Engelstad Arena and Alerus Center box office as well as online at UNDsports.com/tickets. All seating is reserved, and ticket prices are $25 for adults, $12 for youth (12 and under) and $5 for students with a valid student ID. Football season ticket holders have until Wednesday, Nov. 23, at 6 p.m. to claim their same seats for this game. Season ticket-holders can reserve tickets online through their “My North Dakota Account” at UNDsports.com or in person at the Ralph Engelstad Arena box office. All seats not claimed by the deadline will be released for sale to the general public. NoDak Nation announced over the weekend that more than 500 student tickets have been set aside and would be given away this week at the Memorial Union.